this game is a bit different from the original Blackjack. 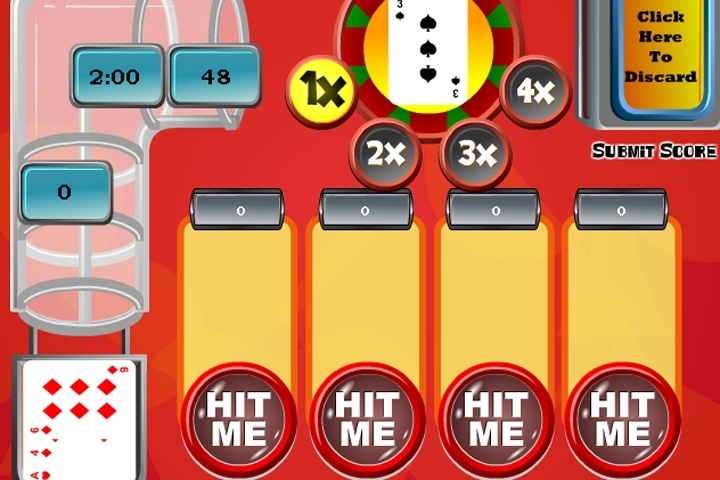 Play 4 Blackjack games in a row and choose which card you want on which pile. Try to get 21 as many times as you can! The object of the game is to get to 21. Click on the "Hit Me" buttons to add the current card to it's corresponding column. Like the classic game "Blackjack," face cards are worth 10, aces are worth 1 or 11 and all other cards are worth their face value. If you go over 21 you bust. Earn bonus points for having 5 or more cards in a stack. Earn more time by getting 21 when a column is lit up. Earn double, triple and quadruple points by getting 21 up to 4 times in a row. Good luck! If you want to play Bumper Blackjack games online you have come to the right place! GamesLoon adds new Bumper Blackjack games every week. This is your game portal where you can find the biggest collection of free Bumper Blackjack games online. Do not forget to rate our Bumper Blackjack free online games while playing!